Management at Santa Anita now plans to reopen for racing on March 29 after agreeing to delay its edict banning all race-day medication. But some industry groups are panning the new rule, saying it will actually harm horses. 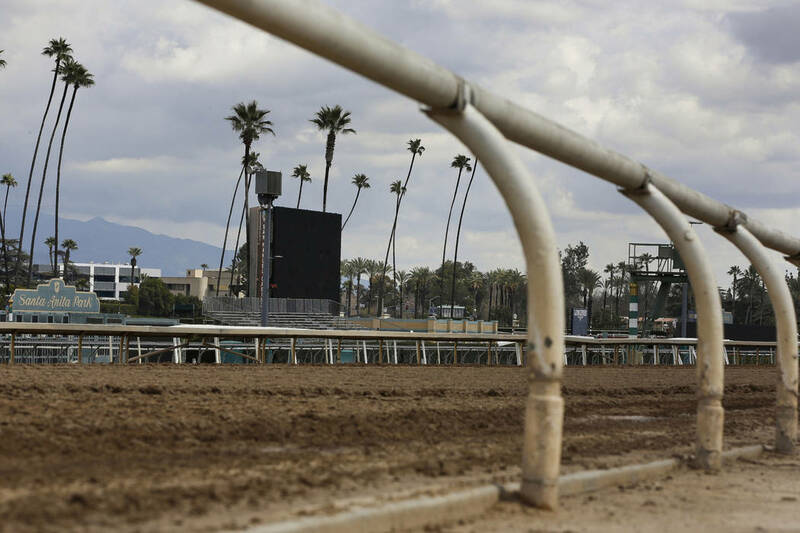 After reaching an agreement to delay implementation of a ban on race-day medication, management at Santa Anita now plans to reopen for racing March 29. Under the deal with the Thoroughbred Owners of California, which must be OK’d by the California Horse Racing Board, the ban on race-day use of the diuretic furosemide, commonly known as Lasix, at Santa Anita Park and Golden Gate Fields would be phased in rather than being immediately imposed. The proposal would require all horses born in or after 2018 compete with no race-day medication, meaning the diuretic furosemide, commonly known as Lasix. This means all 2-year-old horses starting in 2020 and after would race medication free. All horses born prior to 2018 could continue to use the anti-bleeding medication, though only at a maximum of 50 percent of the current levels. Thus eventually all race-day use of the drug would be banned as those older athletes are retired. The Stronach Group last week announced plans to eliminate race-day use of Lasix, and other measures like transparency of all veterinary records; strict limitations on the use of any pain or anti-inflammatory medication and treatment; and limiting jockeys to use of the cushion crop — aka the whip — only as a “corrective safety measure,” as part of a broad safety initiative. That came following the closure of Santa Anita after 22 horses died during training or racing since the current meeting began on Dec. 26. The move drew applause from the Jockey Club and some other industry groups — and even the animal rights group PETA — but it has been panned by other racing stakeholders. “The result ist that it has been decided that appeasement of specific sectors of our society as well as a minority of stakeholders in our industry is more important than prevention of Exercise Induced Pulmonary Hemorrhage in our horses. The message is that a tradition of the old world horse racing industry is more important than the health of the horse,” it said in a statement. Despite the agreement with California owners, it remains to be seen whether some horsemen and owners will pull their horses out of the state rather than comply with the new rules. If they do, that would exacerbate the horse shortage that already plagues racing in California and further diminish handle. In the meantime, one can only hope that the unexplained surge in equine fatalities at “The Great Race Place” is over and that the renewed focus on safety will ultimately translate to more of these magnificent animals returning to the barn in once piece. No matter what it takes, we owe them that. With just six weeks until the Kentucky Derby, the #RJhorseracing handicappers are all about the $1 million Louisiana Derby on Saturday at the Fair Grounds, not to mention the $400,000 New Orleans Handicap (Grade 2) earlier on the card. In the latter, to be contested at 1/18th miles on the main track, the crowd ‘cappers like Copper Bullet, the second choice on the morning line at 4-1. They see the Steve Asmussen-trained son of More Than Ready turning back Mr. Buff (6-1) and morning line favorite Silver Dust (7-2). Copper Bullet is sharp and scary, but I’ll take a shot with Bandua (12-1) if he goes here (he’s also cross-entered in the Muniz Memorial Stakes on the turf later in the card). I like Core Beliefs (6-1) and Lone Sailor (9-2) for the minor awards and will throw in Copper Bullet if Bandua scratches. In the Louisiana Derby (Grade 2), the crew thinks War of Will (the 6-5 morning line favorite) will run his record on the dirt to a perfect 4 for 4. They like Sueno (8-1) and Spinoff (5-2) for the minor placings. I questioned War of Will when we handicapped the Risen Star Stakes awhile back, but I’m no longer a doubter. Since he will offer no value here as the heavy favorite, however, I’m going with Spinoff, who I think will get a perfect stalking trip from his outside post behind likely pace-setter Lemniscate (15-1) and maybe get the jump on the favorite in upper stretch. I see War of Will checking in second and long shot Bankit (20-1) in third. Mike Brunker’s horse racing column appears on Fridays. He can be reached at mbrunker@reviewjournal.com or 702-383-4656. Follow @mike_brunker on Twitter. Sueno is my top pick in the Louisiana Derby, but he is just one of five who have the bulk of the probability to win in my opinion. Sueno earned a 98 Equibase Speed Figure when rallying four paths wide on the turn in the Southwest, eventually beaten 3/4 of a length for the win. Considering the horse Sueno beat for second, Long Range Toddy, improved to a 109 figure in his next start, Sueno should improve as well. Additionally, watching the replay of the Southwest (free via the Equibase Racing Yearbook), I note Sueno galloped out in front of the winner suggesting the added distance of the Louisiana Derby will benefit him very much. Limonite is very likely to go to post as a longshot in the Louisiana Derby and I feel discounting his chances entirely may result in regret. When stretched out to two-turns for the first time last fall, Limonite ran well when beaten a neck on the wire by Roiland after leading in the stretch. Limonite turned the tables on Roiland when they met next as he rallied from last of 14 to third in the Kentucky Jockey Club Stakes, with Roiland checking in fifth. Rested three months and allowed to mature physically and mentally, Limonite ran better than it looked in the Risen Star (when fifth at the finish) as he was steadied in traffic as he rallied from 11th on the far turn, losing all momentum, before passing a few horses. Jockey Jose Ortiz, second only to his brother Irad Ortiz, Jr. in 2018, gets on Limonite for the first time. Although the 89 figure Limonite earned in his best effort when third in the Kentucky Jockey Club would likely not threaten the main contenders here, he could have finished in a higher position if not for traffic trouble last month. Country House finished well for second in the Risen Star after being as far back as 12th in the early stages. His three efforts at a mile or more on dirt have yielded figures of 94, 92 and 93 and except for the 104 figure War of Will earned in the LeComte, those numbers stack up very well in this field. After breaking slowly in the Risen Star, jockey Luis Saez didn’t rush Country House one bit but, when asked, the colt moved from ninth to be second with an eighth of a mile to go. Although he could not make any further progress on War of Will in the stretch, I expect Country House to improve at this 1 1/8th-mile distance and that could help him turn the tables on War of Will. War of Will drew the highly disadvantageous 13 post for the Risen Star and overcame that with a great ride from Tyler Gaffalione, who got the colt to second before the turn to save ground. From there on out, War of Will always looked good, easing off to a two and one-quarter length margin he held the entire last eighth of a mile. With a much better post for the Louisiana Derby, War of Will could win his third straight graded stakes but there are a couple of things which may be against him as well. Per a STATS Race Lens query I ran, sire War Front’s sons and daughters are 0 for 20 the last five years at distances of nine to ten furlongs on dirt. Secondly, although War of Will won the Risen Star easily, his 97 figure was a regression from the 107 he earned one month earlier in the LeComte and I have concerns when a horse on the Derby trail has a regression like that from one race to the next. Spinoff rounds out a quintet that can win, as he’s improved in each of two starts since his maiden-breaking debut last June. Earning a career-best and field high last race 101 figure in his most recent start, Spinoff was most impressive in drawing off to an 11 3/4-length win in his first two-turn race and first following six months off. Likely to be more physically fit in his second start off the layoff, the colt appears to have tactical speed not unlike that shown by War of Will in the Risen Star, so it could turn out jockey John Velazquez gets Spinoff near the inside before the turn to save ground. As a colt by Hard Spun out of the multiple stakes winning mare Zaftig, Spinoff can win just by logically improving off his last effort so must be considered a win contender in a very deep renewal of the Louisiana Derby. Ellis Starr is the national racing analyst for Equibase. Visit the Equibase website for more on the race or to purchase handicapping products.